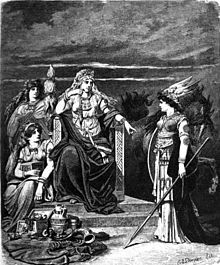 Frigg, enthroned an facin the spear-wieldin goddess Gná, is flanked bi twa goddesses. Ane o whom, Fulla, carries her eski, a widden box. Illustrated (1882) bi Carl Emil Doepler. In Germanic meethology, Frigg (Auld Norse), Frija (Auld Heich German), Frea (Langobardic), an Frige (Auld Inglis) is a goddess. In nearly aw soorces she is described as the wife o the god Odin. In Auld Heich German an Auld Norse sources, she is an aa connectit wi the goddess Fulla. The Scots weekday name Fryday (etymologically Auld Inglis "Frīge's day") bears her name.